Mirage is a real trickster - and like most practical jokers, loves being devious. An experimental, high-speed weapon created by Megatron to breach the intelligence gap between Vehicon generals and their drones. Still, not very smart. Would be useless without Megatron's supervision. Enjoys playing tricks on fellow Vehicons. Can appear out of nowhere to attack Maximals. Sneakiest and most elusive of all Vehicons. Top speed of 300 miles per mega-cycle. Can instantly teleport up to 200 yards. Wields plasma mine blaster and dual missile launchers. Unpopular amongst fellow warriors. 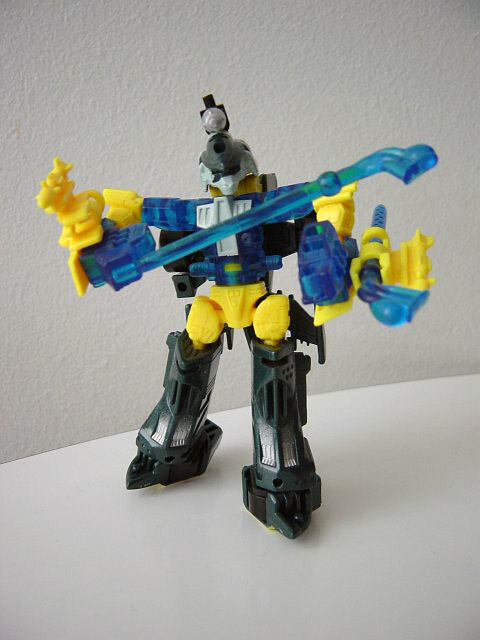 Though not making many appearances on the animated Series Beast Machines, Mirage has been redesigned. Now this time he's a bad guy. 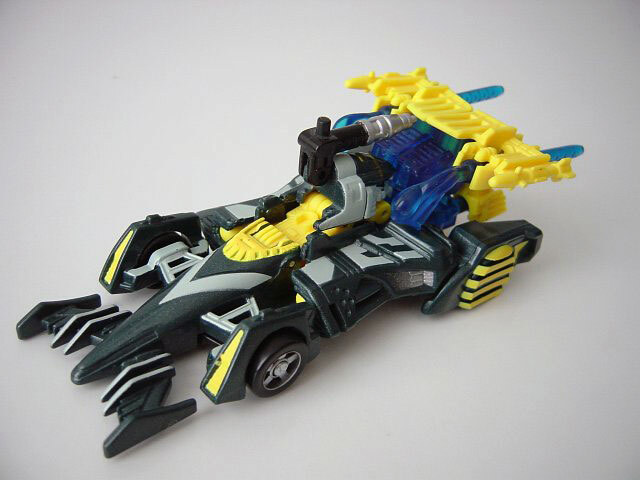 This guy plays tricks on the Maximals and his fellow Vehicons and comes with a few features that may impress. Mirage was the first Transformer I bought after I got back into it and got me started again. Though over four years old I'll review this little bugger. As usual Mirage is a heavily armed Indy car with see through exhaust pipes that become missile later. Overall model is excellent and has average detailing with silver, yellow, blue and dark green. The back wing can be pulled back and manually launch two missile which adds a little fun though the launcher, you must push the missiles to come out. All limbs and parts are hidden well, especially the head which acts as the head rest for the driver's seat. Other than these good points there isn't much to play with but push the car around and see the Vehicon symbol on the bottom. For a basic model I say this will impress. Mirage has a weird but unique way of transforming which may take some people time to transform. The sides of the car are his legs, nose cone is his back and back wing are his hands. Though his overall appearance is pretty good, articulation is a bit lacking so Mirage doesn't have many poses at all. Mostly what you can do is lift his arms up to make him fire his arm missiles. You can't even turn his head. This is the only major let down for Mirage. To be exact, Mirage has ten points of articulation, not including head and waist. Also note that Mirage is only semi-stable. Mirage comes with two exhaust pipe missiles are give him a plus, though I was a bit let down that Hasbro came up with the idea that you push the missile out to launch it with your finger. Sometimes the missile goes nowhere or will even not come out at all. But as a bonus I still love it. Though hard to find him now this guy is worth the cheap price of a basic. Transformation: 8 - Excellent transformation for a basic model, which may challenge many people because the head joint is hard to move at first and some joints may not budge very well. I'll say again that the Indy car mode hides him well anyway. Durability: 7 - Solid joints, missile launchers may wear out in time. Overall sculpting and plastic seems strong enough to last a long beating. Fun: 6 - Indy car is great, transformation may frustrate little kids but missiles add a little bonus. You can't pose much with him, neither he is very stable. Price: 10 - Very cheap. He is definitely worth it.